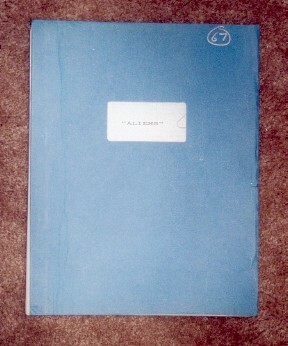 Script used by Roy Charman, production sound mixer on Aliens. 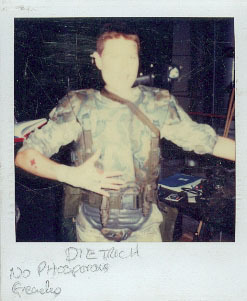 Roy was nominated for an Oscar in 1986 for Aliens. In 1980 he won his second Oscar for his work on Raiders of the Lost Ark, his first Oscar had been awarded 14 years earlier for his debut feauture film, Grand Prix in 1966. Further nominations were awarded in 1974 for the Wind and the Lion, and 1977 for Superman the Movie. His other fantasy film related credits include Legend (1984), Superman II and Superman III. This script is numbered "67" in silver pen on both the cover and inside page 1. It is the final draft, dated Spetember 1985. It contains diaglogue changes in blue pen along with slate numbers and doodles. A similar script seen on set (on the table behind Dietrich).